Superintendent Austin Beutner at his introductory news conference last spring at Belmont High School. *Updated Sept. 27: After today’s first mediation session, LA Unified announced that the next session is set for Oct. 3. LA Unified sweetened its salary offer to the teachers union just before Thursday’s first mediation session, but it did not back down on teacher quality demands — including a call for a new category in evaluations to identify highly effective teachers. 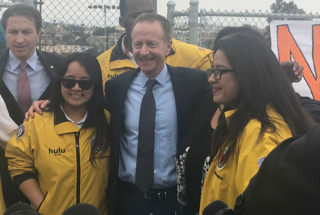 The district’s offer was met by outrage from United Teachers Los Angeles, which shows no intention of backing off its threats to strike. The new offer was approved Tuesday morning in closed session by the school board and made public late Tuesday. The two sides will meet with a mediator Thursday. The teachers have been working without a contract since July 2017. In their last contract, in 2015, they received 10 percent raises. They had not received raises for eight years during the Recession but still received salary boosts based on years of experience and for taking additional educational courses. The district is offering 6 percent raises over two years to all teachers. Even though the district faces bankruptcy in three years and has been warned by both the county and the state, LA Unified’s chief financial officer has said 6 percent raises have been factored into this year’s budget and the district can afford them. But other union demands would cost $1.5 billion beyond the raises and can’t be sustained, the district says. The district’s public statement on its new offer did not include some of its previous negotiation positions, but an email Wednesday from the district’s labor team confirmed that they are still on the table. Those include adding the new teacher evaluation category and a refusal to cede decision-making authority over conversions to magnet schools, student testing, and principals’ budgets. If the district decides to drop any of those, the next chance to open negotiations with the union will be when the new contract runs out in July 2020. A 6 percent raise over two years, made up of a 3 percent raise retroactive for 2017-18, plus another 3 percent raise for 2018-19. A 6 percent raise would match the raises the district’s other labor unions received this year. On Thursday, the day mediation that began with the teachers union, the district announced it had reached a tentative agreement with the Teamsters, for the same raise as it is offering the teachers. The district’s previous offer was a 2 percent raise and a 2 percent bonus. The union wants a 6.5 percent raise that would be retroactive to July 1, 2016. This year’s raise would be contingent on whether the district’s budget report next spring shows positive projected ending balances for 2018-19 and 2019-20. The proposal also includes a provision for extra work and/or training starting this school year. Teachers could also earn extra pay for taking courses, but only in areas that the district prioritizes, such as science, the arts, foreign languages, and technical education. Currently, teachers are eligible for pay raises for taking a wide range of classes, something school board members have been repeatedly urging to change. The requirement for eligibility for health benefits in retirement would increase by two years under the formula that adds up an employee’s age and years of service. This would align with the district’s other employee unions. All eligible retirees and their dependents receive free lifetime health benefits, with no co-pays or premiums. The proposal reduces class sizes by four students in core subjects in 15 middle schools and 75 elementary schools. These high-needs schools are determined under a new Student Equity Needs Index. Starting this school year, the schools are also receiving extra funding and a waiver from having to hire teachers off the district’s “must-place” list. Katie Braude, executive director of the parent advocacy group Speak UP, called on the district to do more on teacher quality. *This article has been updated with the district’s agreement with the Teamsters on Thursday, Sept. 27, and with the next mediation date of Oct 3.